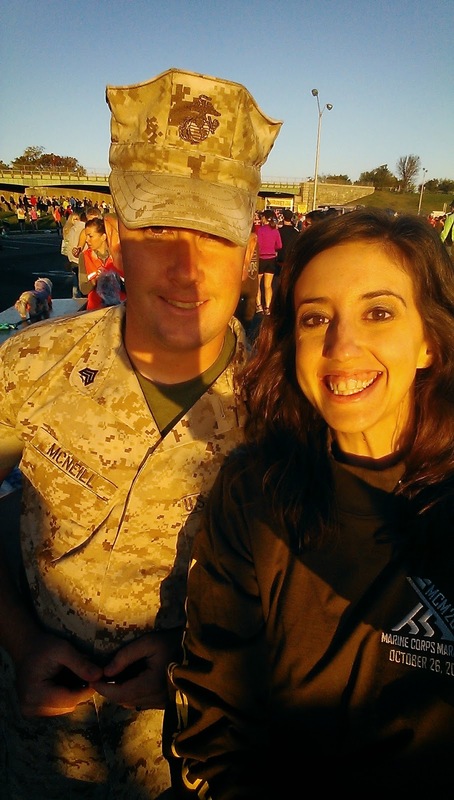 Way back in July, I signed up to volunteer for the 39th annual Marine Corps Marathon (MCM) in Washington, DC. I had heard nothing but rave reviews about this race and knew at some point I'd like to run it. As it is extremely popular, there was a lottery system in place for this year so I knew 2014 wasn't the year I was going to run it. A few of my friends got in for this year so I figured I'd sign up to volunteer. I was hoping for a fun day in DC. Then I got injured. 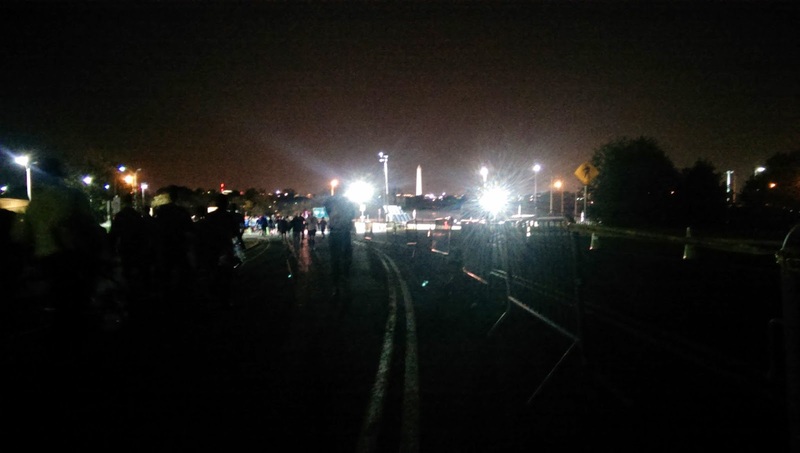 And as time grew closer to the MCM, I stared to get nervous about how I was going to get around DC with 27,000 runners and their cheering sections. I mean, taking the scooter on the metro?! Terrifying! Luckily, I wasn't worried at all about my volunteer position- I had contacted Charlie Harr (Volunteer Coordinator) and let him know I was injured. He changed my volunteer duties so they would be stationary and easy to get to from the Metro. I was originally going to be at information in the morning and then at food station 2 in the afternoon but was reassigned to be at bag check all day. Last Sunday, I woke up at four am, got dressed, and headed out to the Metro station in Vienna, VA. I stayed at Matthew's brother and sister-in-law's place the night before so it was just a 10 minute drive to the station (they're about two hours drive from us). 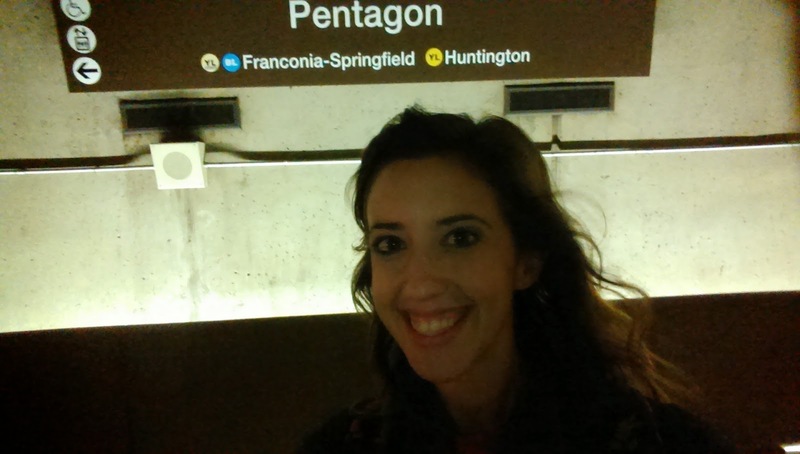 The Metro opened at five and I was on the first train headed toward the Pentagon. There weren't a ton of people and it was very easy to get my scooter on and off the train. Once I got off the Metro, I could hear the starting line announcer. To be honest, he sounded pretty far away! I'm guessing it took me 15-20 minutes to scoot down to the starting line area where I'd report for bag check. But, the Washington Monument was lit up in the distance and it was simply beautiful. I checked in with the volunteer tent and they instructed me to report to Captain Lousche at bag check. Once there, I was assigned to bag check 01 and given a lovely brown volunteer shirt :-) The shirts were the same design as the runner shirts except they were cotton and said "Volunteer" down the sleeve. 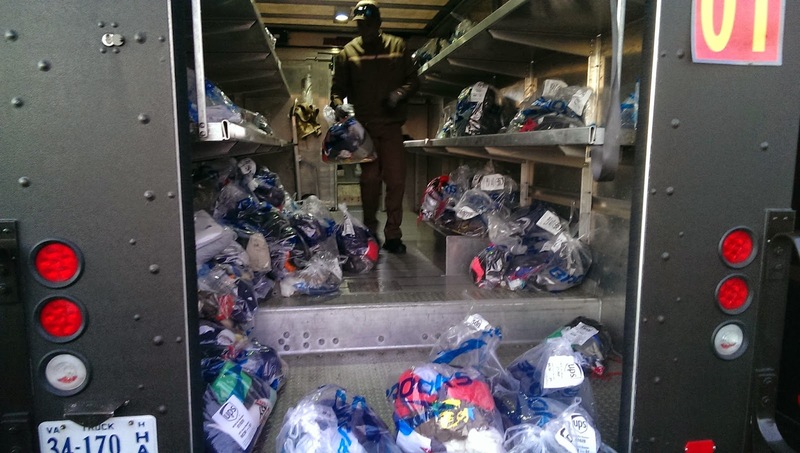 All the bags we were collecting from runners were put into one of about 20 UPS trucks. After the race started, the UPS trucks would then go to the finish line and be ready for the runners at the end of the race. My job was to make sure the bags were tied, the bib number/sticker was clearly visible on the outside, and to call out the number to the UPS staff who would then organize the bags inside the truck. Everything operated like a well-oiled machine. Working with me were a bunch of Marines. 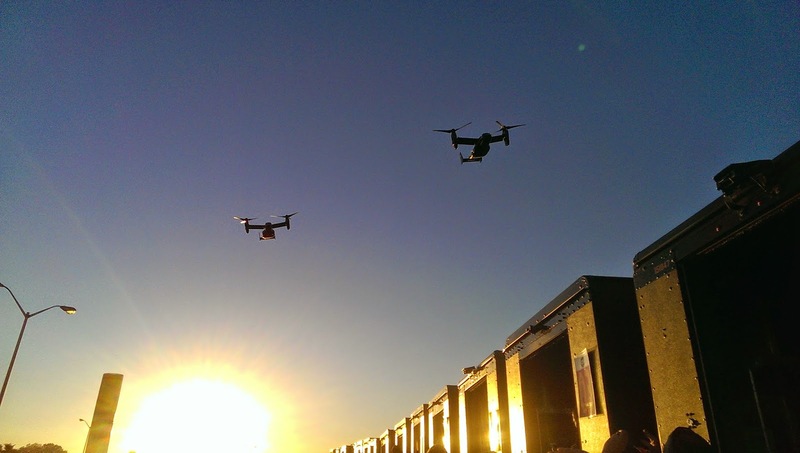 There were a few other civilian volunteers but it was mainly uniformed Marines. They were such a blast to work with! 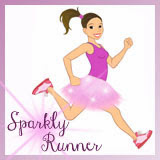 We were joking around with runners and each other all morning. It helped to make the pre-dawn darkness and chilly weather bearable! I mainly worked with Cameron, who (bless his heart!) thought I was 25. Thank you, Cameron :-) I also got to chat with Pam from We Run Disney- thank goodness she was wearing a skirt- she was easy to find! Right before the start, we shut down bag check and the trucks started to leave to get to the finish line. The festivities leading up to the start were incredible! 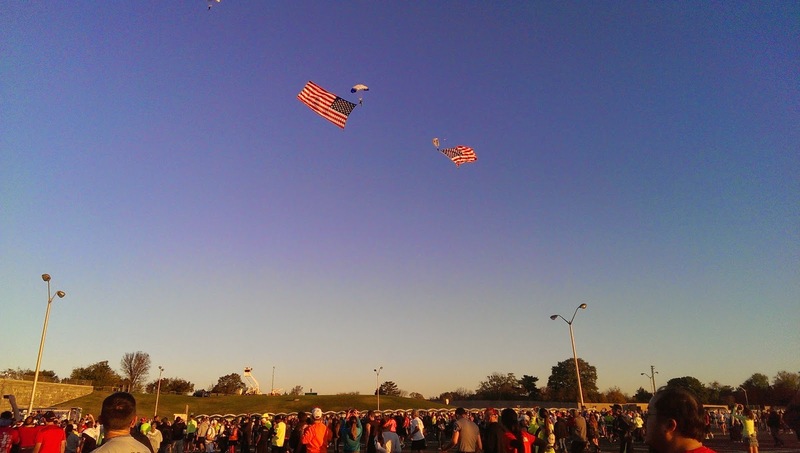 They had people parachuting out of the sky with American flags and all sorts of aircraft flying around. It really was something to see. Pam, about to conquer 26.2! After the start, I headed back toward the Metro station to go to the finish line. However, I knew I had at least two and a half hours before the lead runners would be crossing the finish. As I scootered toward the station, I saw what I thought were marathoners. Turns out, they were the 10kers at about mile 3! 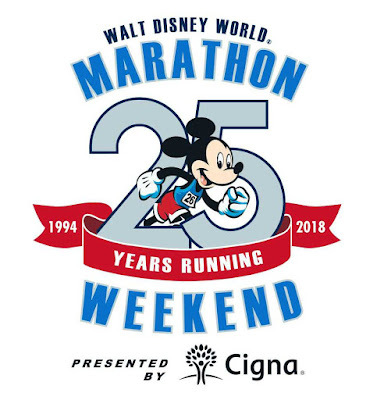 The MCM also includes a 10k that covers the last 6.2 miles of the marathon course and starts at the same time as the marathon. I had brought my cow bells with me so I decided to hang out there for a while and cheer. I'm so glad I did because I was able to see several friends that were competing in the 10k! 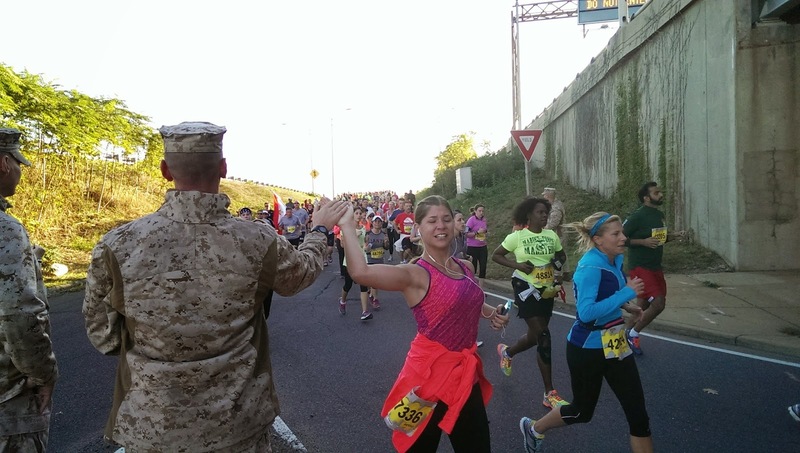 It was also super cool to see all the runners thank the Marines and other military personnel that were on the course- so inspiring! So happy to see Mandy on the course! Lots of high fives for our servicemen! 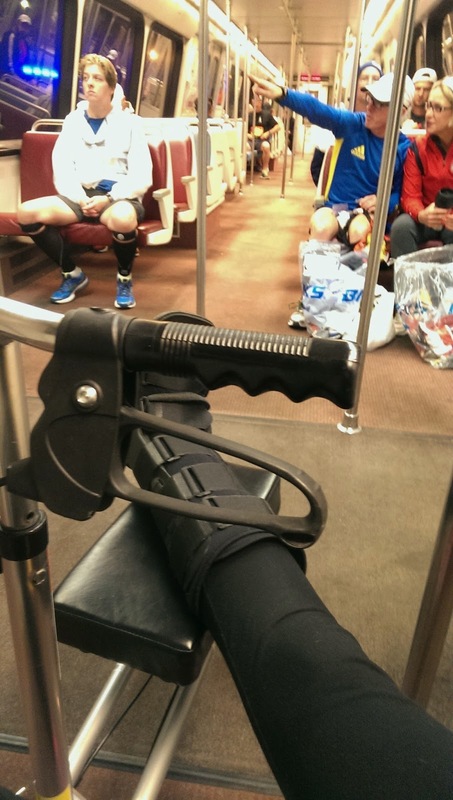 Eventually, I got back on the Metro and got to the finish line. The bag check area wasn't hard to find but I decided to stop into a Panera to get some food and use a real bathroom. 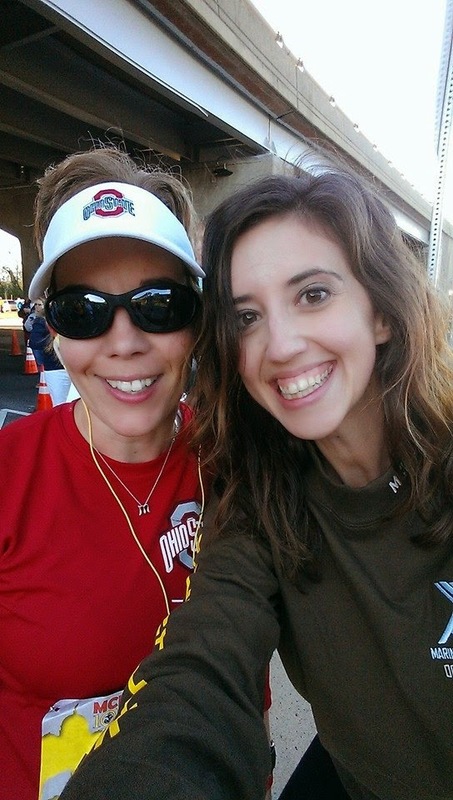 While we waited for finishers to come in, we passed the time by taking selfies and goofing around. Mandy came to hang out for a while after she finished the 10k. It was great to catch up with her and hear about her race. As the runners started to come in and we started handing bags back, it was so awesome to hear how many runners thanked the Marines for their service. It truly made me proud to be American and so thankful for our military. 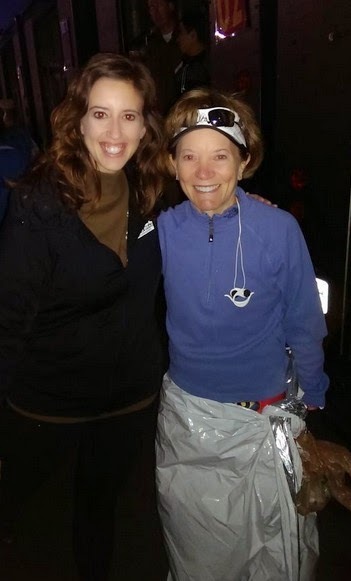 I was able to see a few of the marathon finishers that I wanted to see- including Linzie from Sharp Endurance- while we were waiting for the bulk of the finishers to come claim their bags. It really was busy between the four and five hour finishing time. Around 3 pm, my volunteer shift was over. 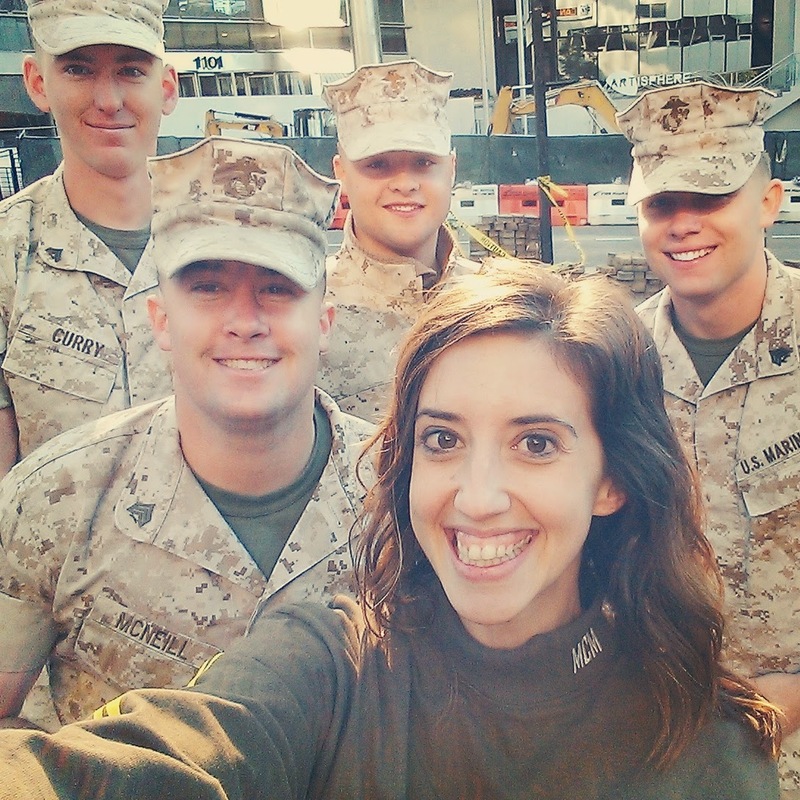 I said goodbye to my new Marine friends and headed toward the finish line. I wanted to see Steph and Nevie and I thought both would be finishing around that time. My phone had died a few hours before so I really didn't know if I'd see them but I figured I'd try anyway. The walk from the finish line to the bag check was crazy long. There were so many people that I couldn't get near the finish. So I parked the scooter along the finisher chute and tried to spot Steph and Nevie. Somehow, out of the thousands and thousands of people, I saw Nevie! I was so happy to see her finish- she'd been out for a few weeks with hip bursitis and wasn't sure if she'd be able to do MCM. It was awesome to see her complete it! Unfortunately, I wasn't able to find Steph. With so many people, it was damn near impossible to find any one person. Around 4 pm, I finally headed back to the crowded Metro station to head home, exhausted from a really fun day. 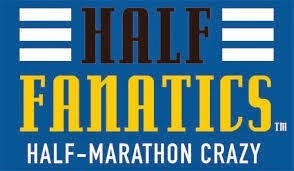 This race was fantastic from beginning to end- from a volunteer/spectator perspective. 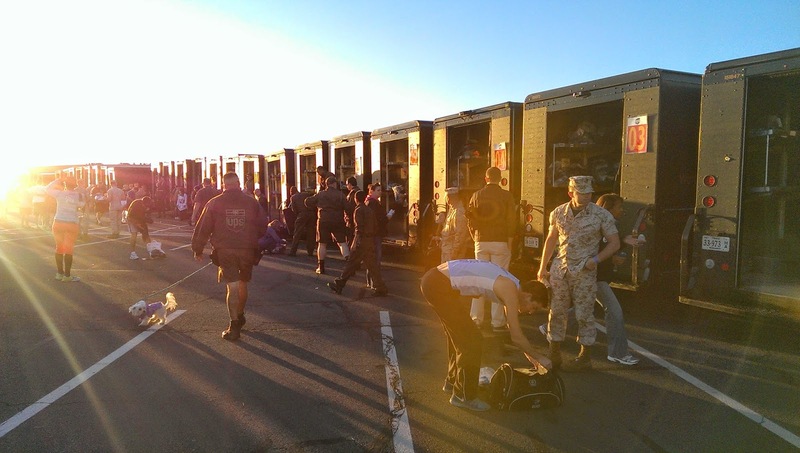 It is incredibly organized and all the volunteers/Marines are super helpful. The metro is easy to navigate and even with tens of thousands of people, I never waited longer than five minutes for a train. The pre-race information was also very timely and useful. I had a lot of email communication with the Volunteer Coordinator and never was confused about where I had to be or what time. I also followed up with him after the race to thank him and he put my picture on the MCM website! How sweet is that? 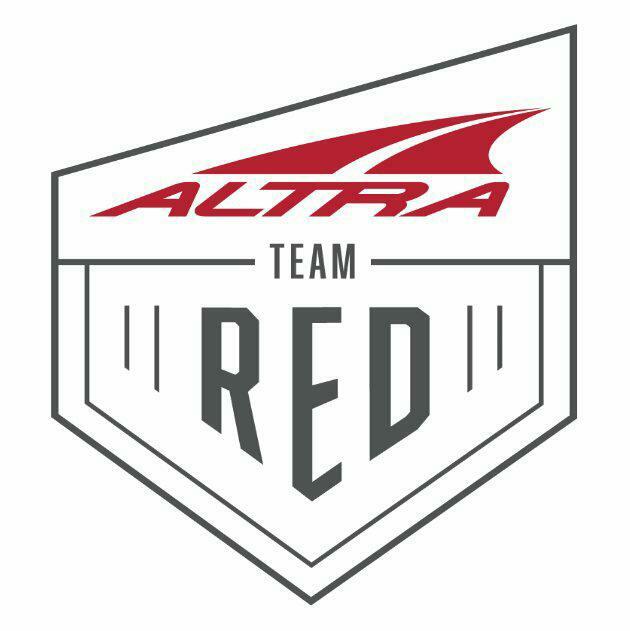 Will I volunteer for this race again? Without a doubt, yes. I'd love to run it at some point, but honestly, I had a blast volunteering and wouldn't hesitate to make the trek down just to volunteer. QOTD: Have you ever volunteered for a race? Which one? Would you do it again? So glad that you had a great experience and that they easily accommodated your injury. We also had an incredibly positive experience volunteering with the Marines and I'd do it again without hesitation. I'm glad you both had a great time- they really know how to put on a race! I volunteered for a kids 5K and they were so darn cute. This sounds amazing though. I actually ran it last year. I'm pretty sure I must have seen you at the Pentagon stop before the race!! Were you on your knee scooter? Yes I was!!!! That was me :-) Sorry we didn't connect!